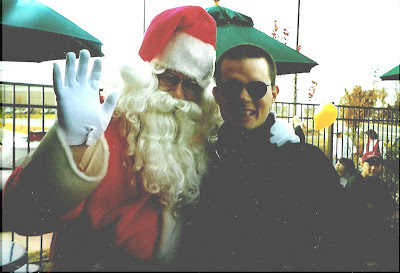 CHRISTMAS TIME IS ALMOST HERE!!!! Nothing brings me back to Grandpa and Grandma Cawley's house on Christmas circa 1977 than Johnny Mathis "Merry Christmas" album! Sure he's a little light in the loafers but he can sing!!!! To each his own, right???? Now that I am of "legal age" I can enjoy some Baileys and hot chocolate to help celebrate baby JESUS's birthday..... Can I get an 'AMEN' from the congregation?!?!?!?!?!? Haven't tried that one yet???? DO IT!!!! It's a little messy but oh so YUMMY!!!!! The new TV is here!!!! About time huh!?!?!? This is the one I chose. I did so much research for so long that I'm crossed eyed. Here I made it easy for you! I have all the sites you need to go to for reviews on not only TVs but all electronics. CNET I wrote my review on this one. I can tell you all about HDMI inputs, dynamic contrast ratios, resolution, pixels and anything that has to do with an LCD TV and after reading all the customer reviews I have come to the conclusion that people will complain about ANYTHING!!! GEEZ!!!! Read some of the reviews and what people complain about and you'll see what I mean... Here it is in all of it's glory!!! AND THEN! Last weekend I was talking to my neighbor, Greg I swear if he called me Drew I would think he is my cousin Marty, and he asked me about my new TV and I told him that I hooked up some bunny ears and I got a few HD channels... He then asked if I wanted the outdoor antenna that was left by the previous owners! SWEET!!! I installed that baby and BOOM!!! My TV found about 20 HD channels!!! HOT DOG!!!!!! Here's another place you can go to learn about how all TV stations in the USA have to broadcast in HD, or as they call it DTV, in 2009. This is Russ my step grandfather. This guy scared the holy ghost out of me when I was a kid...... He is long gone, hopefully kickin' back in heaven wearing his slippers and brown socks. I found this picture of him, he was a security guard at the Westinghouse plant in Ohio, and I modified it in Photo Shop for inspiration. 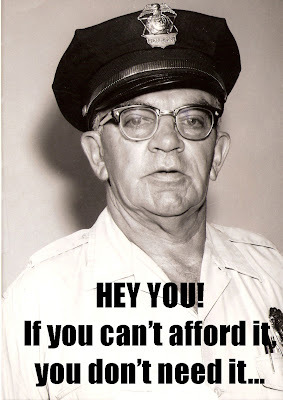 Whenever I get an itch to buy something I don't have the money for I just look at that picture and I am curred of any thoughts of wasteful spending. Hey remember my good friend Mark and his girlfriend Melissa???? You know, They met us at Michigan for the race back in June. Look what he got her for Christmas!!!!!!! 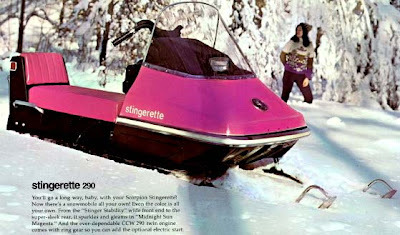 How COOL is it that she loves a vintage pink snowmobile, that has probably seen better days, her boyfriend bought her? SINGER!!! Listen to me!!!! MARRY HER NOW because they don't make too many like Melissa! Plus I want to go to the wedding and talk to any of the single bridesmaids....... "Hey ladies!!! Want to hear a joke I heard from my Teamster buddy?????" Where can I find a girl like that!?!?!?!?!? I mean really? Where are girls like that who get excited about a PINK snowmobile??? Up in Northeast Ohio? WHERE???? That my friends is one COOL A$$ GIRL!!!!!!! Mark is one lucky guy.... He's always been lucky like the time D*$%^@ W&^% let us look d%*& her s!@#$....... AHHH GOOD TIMES!!!!!! Let's just say that we saw the top of the mountain that night and it was good!!!!!!!!!!!!!!!!!!!! Speaking of dating, I had a dilemma: Join one of those online dating sites or get my septic tank pumped out. Guess which one I decided on??? You got it!!!!!! I figured it's better to have crap pumped out of my life then having it pumped in.... Know what I am saying???? Howard from yeap 'Howard's septic tank cleaning' came out. I thought it would be as bad as the time Boike had me empty out the black tank on the RV!!! NASTY!!!! Now I know what hell is like.... Heck, I think I got spinal meningitis from that little experience. YUCK!!!! Anyways, Howard had that baby all cleaned out in an 1/2 hour!!! I guess when you pump poop all day you kinda know what you are doing and pumping out a septic tank is pretty simple. Friday night my ASU Mountaineers were playing for the 1AA championship and to enjoy the game and celebrate them winning their third championship in a row.......... I decided to splurge and get a sixer of Newcastle.... It's some of the best beer you can get and it better be for freakin' $8.50!!!!! It's a great beer and I noticed that it does not give you a bad hang over like my regular purchase PBR does. HMMMMMM..... Interesting observation but I think I will stick with my PBR that I can get a 12 pack for less than the sixer of Newcastle.